Image from Eaton’s – Golden Jubilee (1869-1919) (T. Eaton Co Ltd, 1919). At exactly ten o’clock in the morning on February 25, 1931, more than five hundred women of the International Ladies’ Garment Workers’ Union (ILGWU) put down their work, halted their machines, and walked out of garment shops across the city. It was the beginning of a general strike of dressmakers, a long but ultimately unsuccessful fight for a 15% wage increase, recognition of their union, and the implementation of impartial arbitration. All my life I will never forget this strike. It was so terrible that the police protected the shops, and they treated the workers like garbage. It was so horrible. I tell you, I remember how they came so close by with the horses. The picketers they treated terrible. They protected the strikebreakers. So you know even [if] you didn’t believe in unions … you believed in unions when you saw what was [happening]. 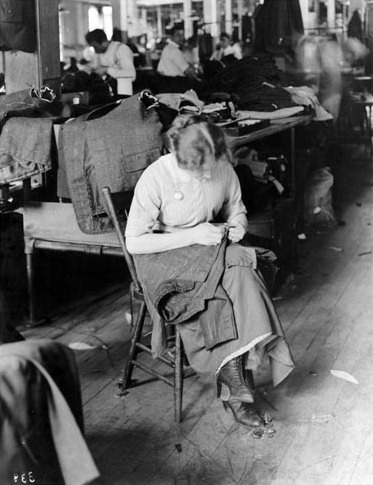 Despite growing knowledge of the sweatshop conditions endured by the women and immigrants employed in the needle trades, the strikers did not enjoy public support. Many Torontonians interpreted the workers’ wage demands as greedy in the midst of the Depression. After two-and-a-half months, the strike ultimately ended in failure, abandoned at a mass rally attended by a thousand supporters on May 5. Strikes like this were endemic in the needle trades in the early twentieth century as men and women sought better wages and working conditions. But, despite some gains, the early labour movement had little sustained success in improving the lot of workers. In the garment industry, conditions remained as deplorable on the eve of the Second World War as when a young and social-minded William Lyon Mackenzie King first investigated sweatshops in 1897. Image from Eaton’s – Golden Jubilee (1869-1919) (T. Eaton Co Ltd., 1919). In 1931, as Srigley notes, one in four Toronto wage earners were women—a higher percentage of women in the workforce than other Canadian cities. With occupational options very limited, 17% of the working women were employed in manufacturing, including the needle trades. While men occupied the more skilled positions like trimmers and cutters, machine operators, and pressers (and were paid a guaranteed weekly wage rather than by a piece-work rate), women occupied positions that were considered unskilled. They were most vulnerable to the industry’s exploitative conditions. 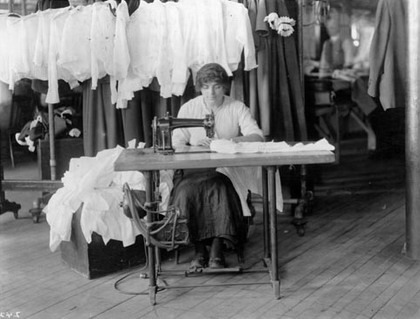 The men’s and ladies’ garments industry was largely composed of small firms and subcontractors competing frenetically for contract orders, constantly racing to drive their production costs ever lower. 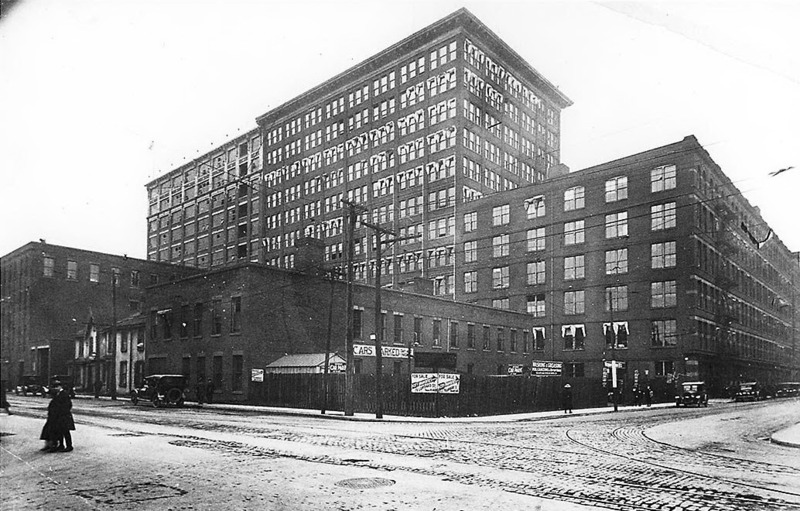 One exception was the T. Eaton Company, which had, by 1920, nineteen acres of factories housing 6,411 employees working at five thousand electric machines to supply products for their mail order and retail trade. Similar conditions existed across the garment industry. Reports of the day—cited in Michiel Horn’s The Dirty Thirties (Copp Clark, 1972)—described shop floors as “ill-lighted, unheated, unventilated,” crowded with workers hunched over their machines. Frequently, employees were not even allowed to speak to each other while working. Starch filled the air, one worker reporter, making your “throat sore and your nose stuffed up and you felt a wreck.” But if a window was opened, there were serious cold drafts. 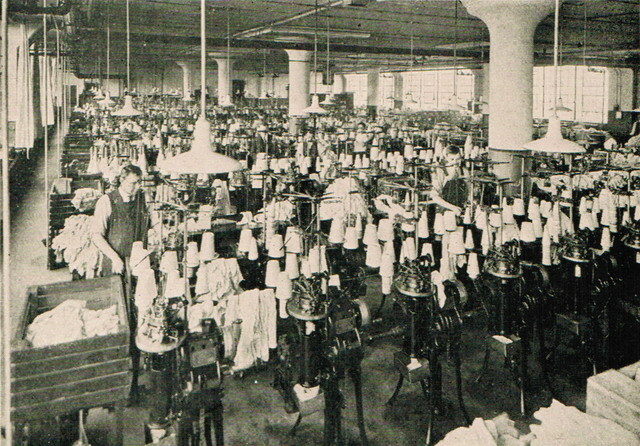 Eaton’s manufacturing, tailoring, and sewing department, making Eaton Brand Clothing. 1912. Archives of Ontario (F 229-308-0-1837-3). Worse than the physical conditions were the “brutal task-masters” who swore at—or sexually harassed—the women, and discriminated in the distribution of piece-work to reward their favourites, or those who did them favours, with additional pay. Slower workers, or those who showed up even five minutes late, might be sent home without pay for indefinite periods. The supervisors used stop-watches and implemented speed-ups when orders increased. Conditions in the garment industry were brutal, but even more so for women who were treated as a second-class, reserve workforce. In busy seasons they were expected to work long hours, only to be the first laid off during the spells of low orders. Skilled workers—that is, men—were in a slightly less precarious employment situation because their specialized skills gave them more bargaining power, and they were able to more effectively utilize the trade union movement. actions. But this often only occurred when their interests coincided, like in 1912—described in historian Ruth A. Frager’s in Gender Conflicts: New Essays in Women’s History (University of Toronto Press, 1992)—when men being asked to do (what they perceived as) women’s work for no additional pay resulted in a wide-scale strike to protect the women’s jobs. In the 1920s and 1930s Ontario did have a minimum wage law, but it was filled with loopholes. According to Catherine Macleod’s “Women in Production: The Toronto Dressmakers’ Strike of 1931,” in Women at Work (Canadian Women’s Educational Press, 1974), the law stipulated that only 60% of a company’s piece-work employees had to be earning the minimum weekly wage of $12.50. The rest of the piece-work employees and any part-time employees were effectively unprotected by the law. Woman using Beswich sewing machine, ca. 1912. Archives of Ontario (F 229-308-0-1823). Furthermore, employers found ways to game the system. Management set piece-work rates according to the fastest worker, making it difficult for slower workers to achieve the minimum. In addition, the under-staffed Department of Public Works and Labour rarely inspected minimum wage violations, which carried only minor punitive fines in any case. And the workers themselves rarely filed complaints with the department for fear of jeopardizing their job. If working conditions were already bad, the Depression made them worse. When the public’s demand for new clothing decreased sharply, the garment workers were the first to suffer through layoffs and wage cut after wage cut. In the early 1930s, according to Frager’s Sweatshop Strife (University of Toronto Press, 1992), the average pay for a full week’s work fell 30% to 50%. For example, one Eaton’s needle worker, Miss Nolan, later told a government committee that she’d once been paid $3.60 for making a dozen voile dresses but was, by 1933, making only $1.75 for the same work. Many senior, long-term employees couldn’t make the minimum wage. Now finding it next to impossible to make the minimum wage after nineteen years working at Eaton’s, one woman reported that she had to sell her furniture just to survive. On the other hand, women on the shop floor also found ways to help each other. In Discounted Labour (University of Toronto Press, 2005), historians Frager and Carmela Patrias argued that piece workers sometimes urged faster workers to slow down or to give some finished work to a slower colleague to ensure that they too would meet their production quota. T. Eaton factories, ca. 1912. City of Toronto Archives, Fonds 1244, Item 7034A. The workers also tried to organize unions, but in the first half of the twentieth century the labour movement was not particularly successful at improving conditions in the needle trades. Some companies simply dismissed employees who tried to organize. Others sometimes made piecemeal concessions to dissuade union formation. Although a number of unions—the ILGWU and the United Garment Workers, for example—were active in this period, they were often not recognized by company management. Larger firms were able to withstand strikes by waiting out the strikers, hiring scabs, or contracting work to Montreal. Eaton’s was even able to import strike-breaking workers from England. The major retailer was also able to use its position as a leading advertiser to discourage newspapers from publishing stories sympathetic to the labour point of view. 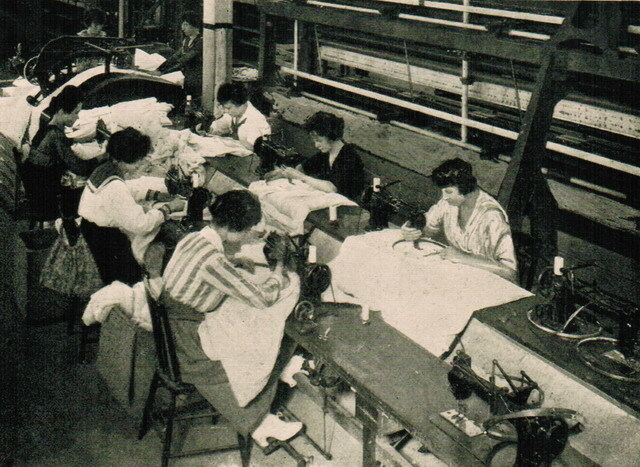 Eaton’s manufacturing-tailoring and sewing department-making Eaton Brand clothing, 1912. Archives of Ontario (F 229-308-0-1837-2). For the duration of the 1931 strike, women carrying placards on the picket line were harassed and intimidated by a private detective agency hired by the employers. Bernard Shane, manager of the ILGWU, noted that “the plain-clothesmen were pushing, kicking, and stepping on the feet of the women on the picket line.” Some strikers were arrested by the city police, who were more interested in protecting strikebreakers still working inside. Throughout the interwar period, management also fostered and exploited ingrained tensions within Toronto’s working class. Among the immigrant workforce in the needle trades, the city’s growing Jewish population was particularly prevalent. Members of this community also occupied many union leadership positions (and others owned garment factories). Several dressmakers recalled an Eaton’s manager who less-than-subtly suggested that gentiles ought not to belong to unions controlled by Jews. As a result of nativist sentiment in Toronto, gentile workers sometimes didn’t walk out on strikes in solidarity with their Jewish colleagues. In turn, if gentile women sought to strike—as happened in a 1934 Eaton’s strike—the Jewish leadership of local unions did not always support their initiative. Similarly, women strikers did not always have the support of male workers in job actions. A major factor in the limited success of the labour movement was that garment workers of all stripes became pawns in the ideological infighting between Communists and socialists within the labour movement who competed for the same membership from the same factories. Formed in the late 1920s, the Industrial Union of Needle Trade Workers (IUNTW), a Communist organization, aggressively sought to undercut the power of the more established (and conservative) unions like the ILGWU. When the IUNTW membership went on strike, the ILGWU helped organized strikebreakers (or so the IUNTW claimed). If one union or the other gained a foothold in a factory or with an employer, they’d try to get their opponents fired. Frager and Patrias have argued that these unions were more interested in gaining power and scoring ideological points than in securing better conditions over the long term. This allowed employers to play one faction off of the other for their own benefit. Probably as effective at improving the lot of workers over the long term as these unions was the work of a parliamentary committee that drew attention to the plight of workers. Prime Minister R.B. Bennett’s minister of trade and commerce, H.H. Stevens, was suspicious of whether major retailers were gouging the Canadian public and reaping enormous profits while crying poor in the height of the Depression. In mid-February 1934, he headed a select committee (which evolved into the Royal Commission on Price Spreads) that aimed “to investigate ‘the causes of the large spread between the prices received for commodities by the producer’ and the prices paid by the consumer” across a wide range of sectors—including department stores and the garment industries. 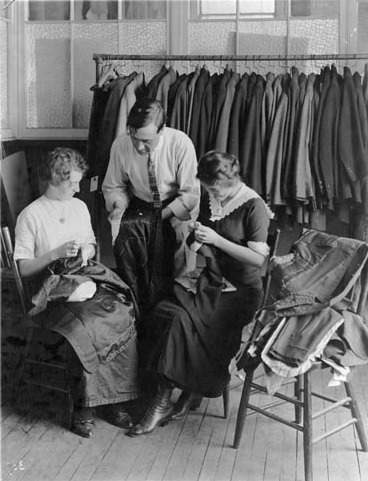 Eaton’s employees at work in the tailor shop, ca. 1910. Archives of Ontario (F 229-308-0-372). For eighteen weeks, a committee room packed with MPs, journalists, and company representatives heard public testimony on all aspects of big business. Government investigators reported the findings of audits that scrutinized the accounts of private companies. The audience heard how companies like Simpsons, who had made poor business decisions, applied pressure to their manufacturing contractors rather than raise prices. There was a long stream of garment workers who testified, providing sensationalist fodder for the journalists in attendance. One witness, Mrs. Annie S. Wells, went into great detail explaining how elaborate dresses—with belt loops, sleeves, and intricate stitching—that retailed for $1.59 earned her only nine-and-a-half cents per item. The public hearings, which became the biggest newspaper story of the year, fuelled public resentment of big business—and by extension heightened broader public sympathy for the plight of garment workers. In the Second World War and after, a new generation of labour unions (such as the Congress of Industrial Organizations) proved more effective at securing equitable working conditions for those in the needle trades and other factories. Other sources consulted: Irving Abella and David Millar, eds., The Canadian Worker in the Twentieth Century (Oxford University Press, 1978); Eileen Sufrin, The Eaton Drive (Fitzhenry & Whiteside, 1982); and Richard Wilbur, H.H. Stevens 1878–1973 (University of Toronto Press, 1977).